Synopsis: Raven (Omealth, in the language of the Kwakiutl Indians) was the agent of the Supreme Creator, transforming the world and bringing light, waters, and the soils that are the basis for all resources. In Kwakiutl cosmology, Raven kept a careful eye on these resources and harmonized nature’s forces – sun, wind, rain, and tides. He also could see into the past and future and, as the trickster, would set people along new paths. 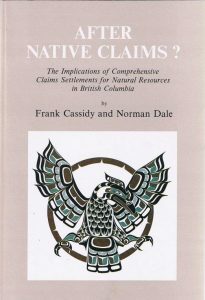 this volume is also about transformations and resources.The authors look critically at the uncertainty surrounding comprehensive land claims in British Columbia and at the paths native groups are taking in projects concerning fisheries, forestry, and minerals. The analysis of these initiatives is aimed at bringing light to the critical and timely question: what might the future of resource use and management look like After Native Claims?